The Airn Curtain depictit as a black line. 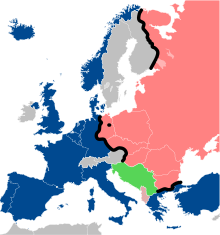 Warsaw Pact kintras on ane side o the Airn Curtain appeir shadit reid; NATO members on the ither shadit blue; militarily neutral kintras shadit gray. The black dot represents Wast Berlin. Yugoslavie, awtho communist-ruled, remeened lairgely independent o the twa major blocs an is shadit green. Communist Albanie breuk aff contacts wi the Soviet Union in the early 1960s, alignin itself wi the Fowkrepublic o Cheenae efter the Sino-Soviet split; it appears stripe-hatched wi grey. The Airn Curtain wis the name for the boondary dividin Europe intae twa separate auries frae the end o Warld War II in 1945 till the end o the Cauld War in 1991. This page wis last eeditit on 20 Februar 2018, at 07:04.